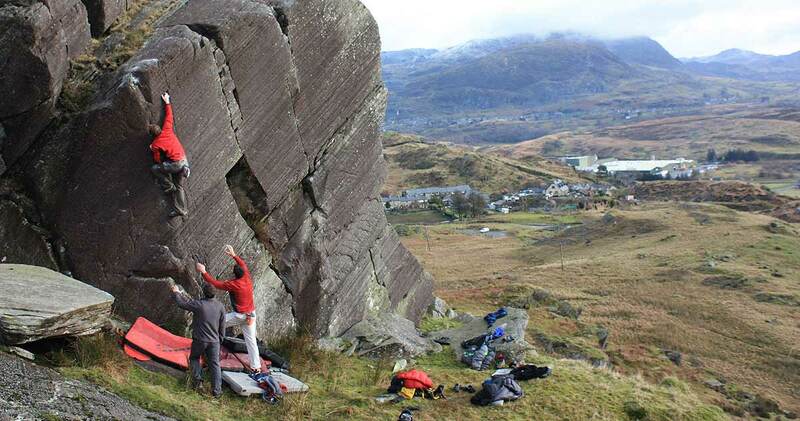 Blaenau’s premier bouldering venue with an impressive collection of problems found both above and below the dam road which runs below Craig yr Wrysgan and Clogwyn yr Oen. 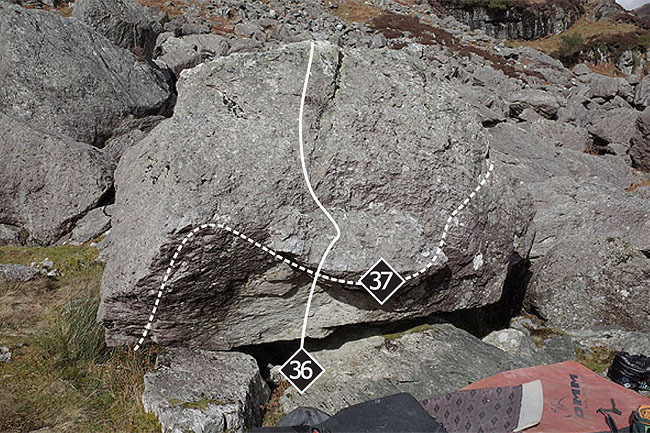 Historically the bouldering above the dam road has seen the most attention, and produced some of the hardest problems; however the rock quality below the dam road is significantly better. Here you will find an extensive area of walls and slabs with some very high quality problems. 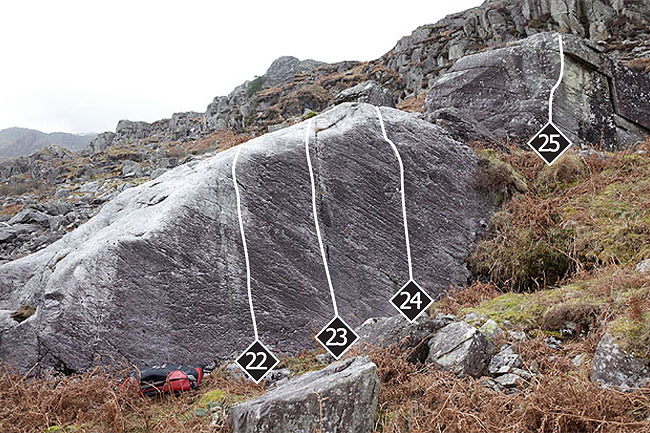 There is a good spread of grades at Tan y Grisiau, plus plenty of different styles of problem on offer, from highball arêtes and walls to powerful roofs. The landings are generally quite good; nonetheless pads and spotters will be appreciated by most visitors. 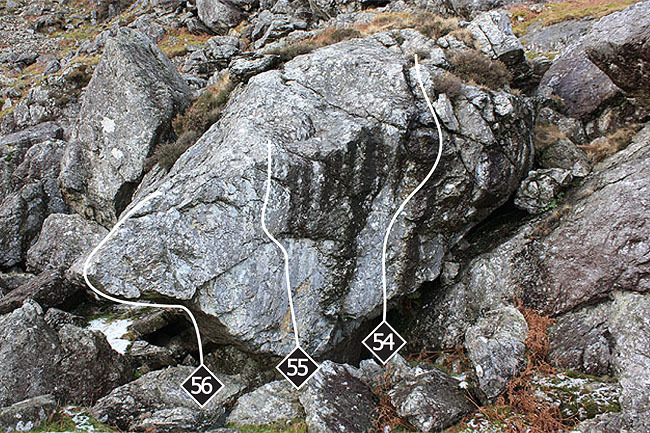 Conditions: The boulders get plenty of sunshine and are mostly quick drying; the exception being Geoff’s Roof which is often dripping with seepage. 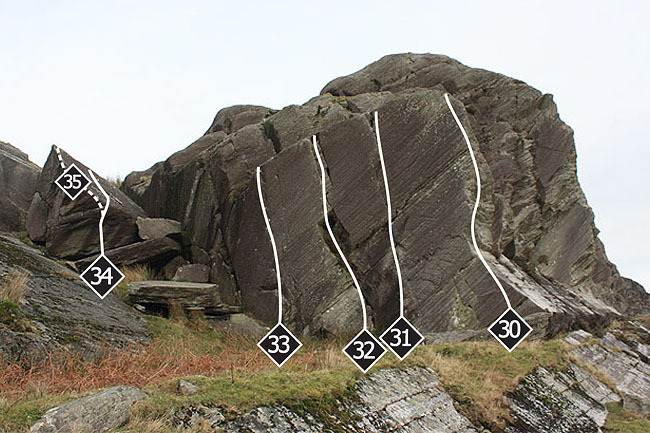 Providing it is not raining (or snowing) climbing is possible throughout the year. Approach: Just after turning off the A496, take the left turn towards the power station; follow the road around past the cafe and then up to the right and over the railway crossing. Go up the hill for 200m (ignoring the first two lay-bys on the right, which have double yellow parking restriction lines) and park at the next lay-by on the right which sits opposite a five bar gate on the left side of the road. Go through the gate and head left to a little stream. 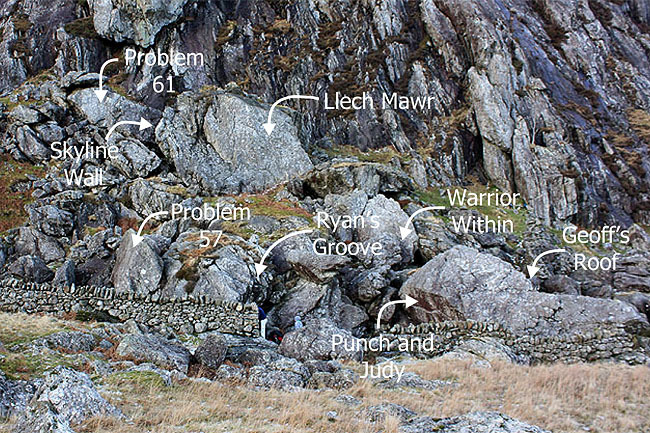 At the stream head uphill trending slightly to the left – the first problems are at the left hand end of the complex of crags. 40m up and left of Chemical Crack is a steep little buttress above a wide mossy terrace. 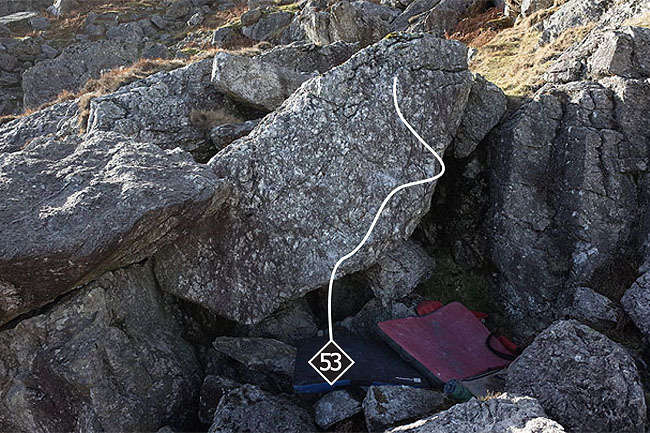 25m left and slightly up from Sboncen is a white wall with a steep undercut arête on the right and a willow tree on the left. The landing can get very boggy here. To reach the next section cross a small stream on the right and head up rightwards on a vague path leading past a tiny wall in a notch. Above is a wide grassy terrace and a series of attractive, just-off-vertical walls. Over on the left, just on the left side of the stream is a neat wall. 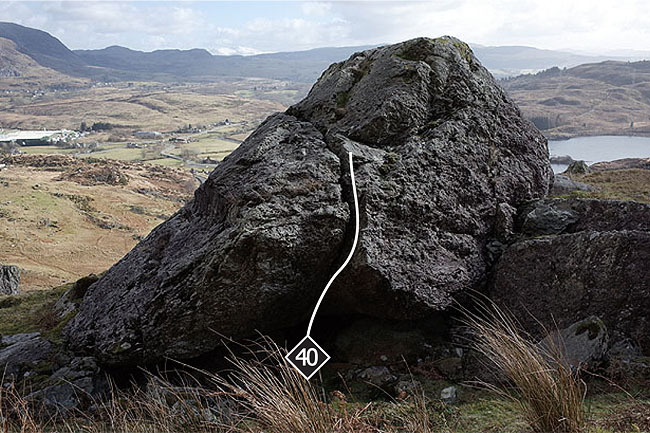 The landing ledge has a considerable drop-off so care is required. The blank wall is a potential project. 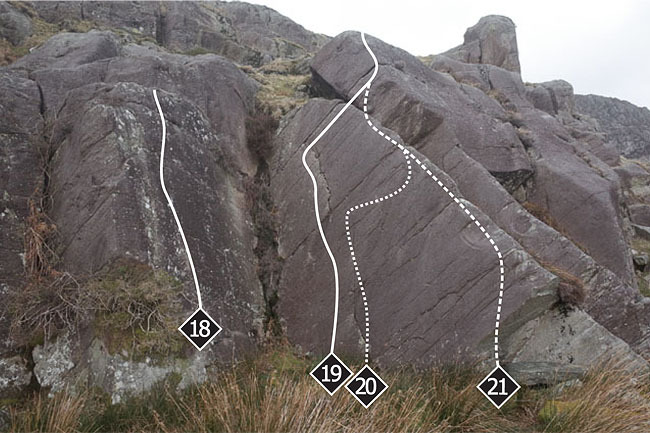 The crack and right arête. 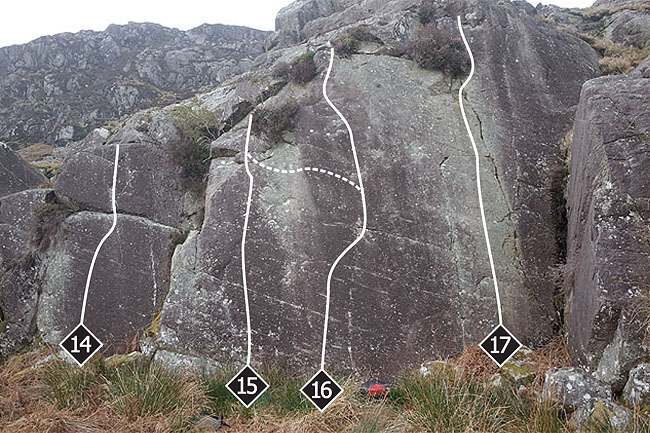 15m to the right is the main event hereabouts, an impressive highball wall. 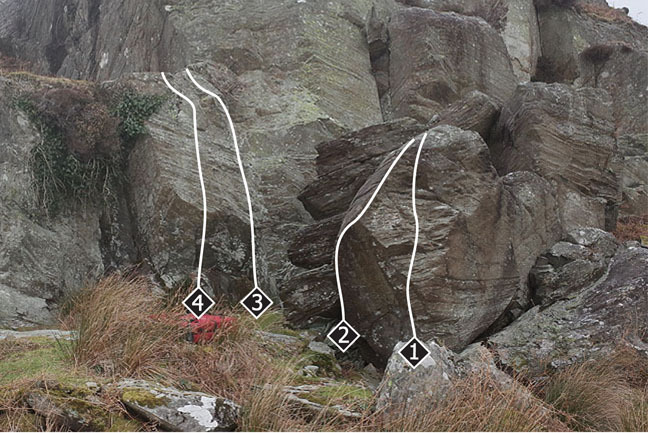 The left hand line on the big wall is spoilt by a lack of independence from the easy left arête. It is still good though if you avoid the arête low down. 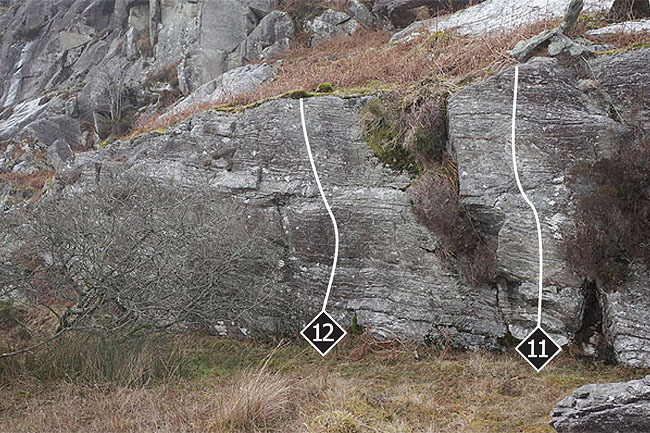 The crack on the right side of the wall is an excellent highball line but the rocky landing does require care (and ideally, lots of pads). Round to the right is a small bay with an attractive right wall. To reach the final section drop back down to the Squelch wall and head across to the incline which leads up to the Tempest area and the dam road. 25m beyond the incline is a pale slabby wall with a sloping top. 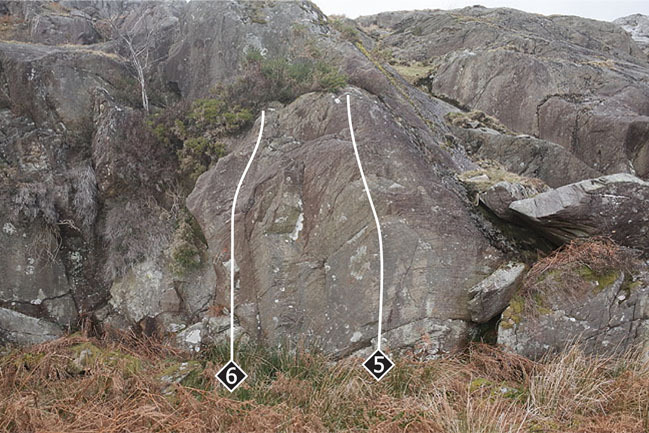 50m to the left, and at a slightly higher level, there is a distinctive pair of blocks, split by a wide, left leaning crack. The next section is situated further up the hillside on the right side of the incline. Approach it from the incline, either from below, or by dropping down the incline from the dam road. 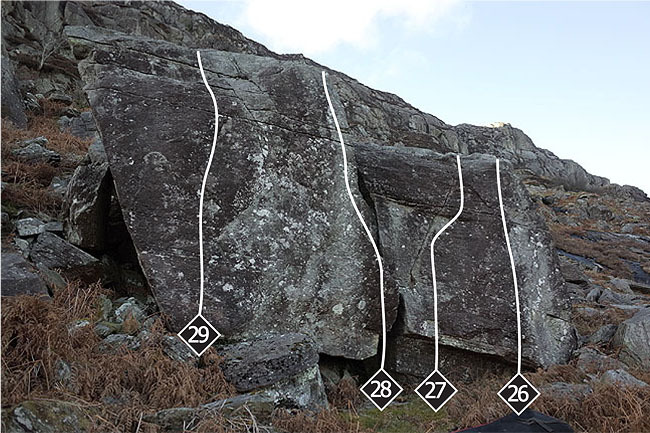 There are some eye-catching walls close to the side of the incline – these have some route lines, but the bouldering section is set back 20m to the right. The big arête at the right side of the face is a bit of a frightener. 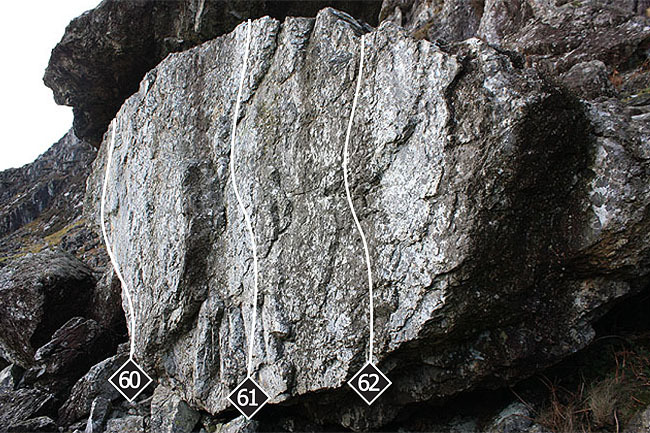 The thin highball crack is a compelling line, but unless you are climbing well within your grade, approach it with care! A distinctive forefinger mono move proves to be the key to success. 32. 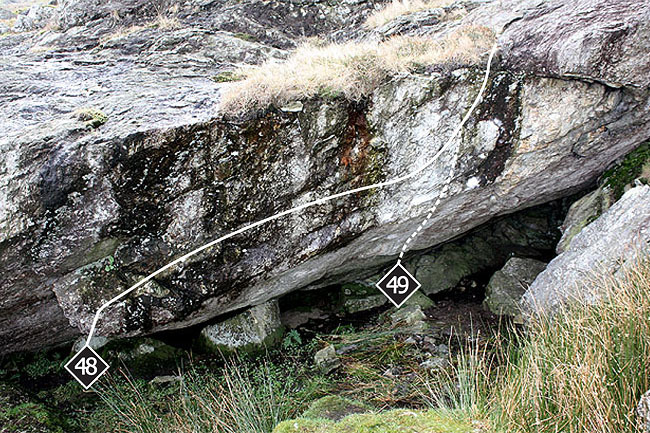 Hollt yr Arch 5C! Another scary highball, but this time at a more amenable grade. the right hand. This can be done static by taking a slightly higher sidepull. Start matched in the big break and make a difficult transition to the upper slab; various methods exist, some harder than others. The rest of the circuit can be found up by the side of the Stylan Dam service road. There is a good spread of grades here, plus some hard test pieces. The rock is a bit sharp and snappy in places; however the more established problems tend to have better rock. Approach: If coming from the ‘below the road’ circuit just walk up the incline and turn left. 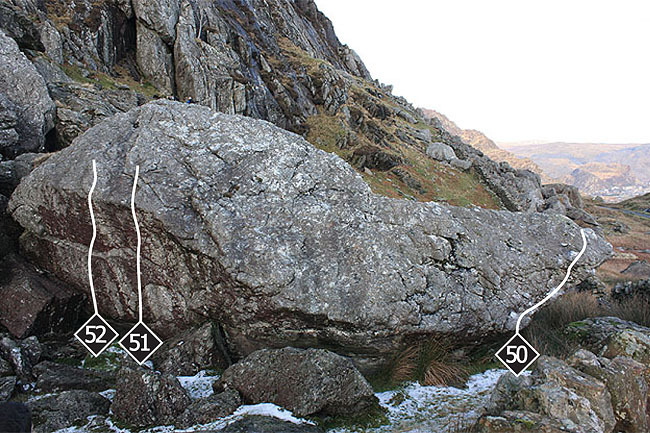 Alternatively, if the main focus of your visit is to try problems ‘above the road’ then it is best to approach from the Cwm Orthin car park. To reach this from the ‘below the road’ approach you have two options; 1. Just walk up the road from the lay-by for 50m, and then split off left to follow the dam road up. 2. (slightly less walking) Drive up from the lay-by and bear right at the road split then turn left at the T junction. 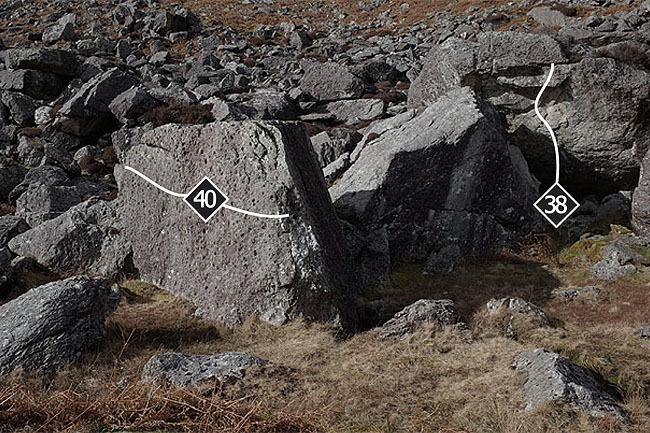 Follow the road round for 200m, passing beneath the quarry tip on the right to park in a large lay-by on the left. The road ends here; beyond the gate is the start of the track rising up into Cwm Orthin. Follow a path breaking off left from the Cwm Orthin track, cross the footbridge over the stream and continue over to join the dam road which runs across the hill side beneath Craig yr Wrysgan and Clogwyn yr Oen. Follow the road until it crosses a prominent incline. 50m beyond the incline you will see the first of the described problems on the right side of the road. Traverse the pocketed wall on the left side of the block left of Flick of the Wrist. 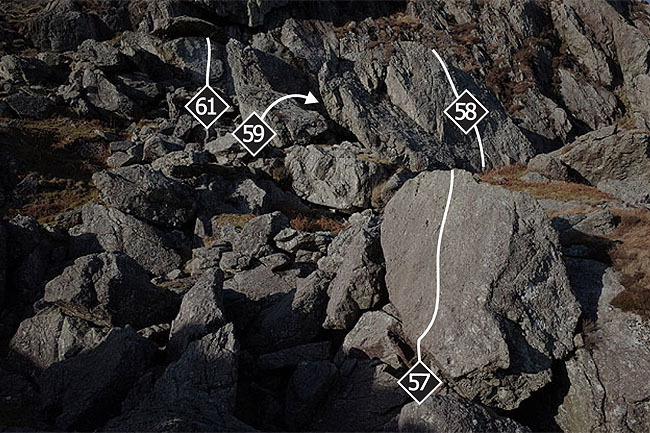 Start at the arête nearest the road and head leftwards, passing a distinct crux section. On the opposite side of the road there is a boulder split by a hand crack. Climb the crack from a sit down start. A good introduction to the fine art of jamming. 25m left of Flick of the Wrist a 50cm high stone wall runs away from the road. The wall leads to a boulder with an overhanging face in a pit. 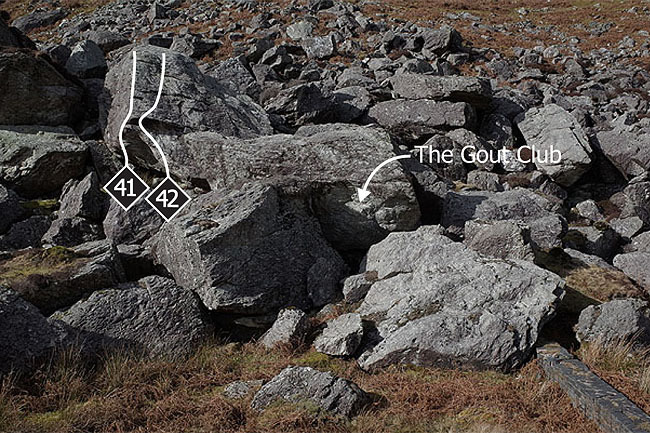 This is The Gout Club, an old 7A+ which has lost a crucial hold and is currently unclimbed. The problem started on a pair of obvious edges. Start crouching with hands on the edge and pocket on the left side of the alcove just left of The Rib. Climb straight up through the bulge. Make sure the landing is well padded out. 500m further up the dam road and past a bend there is a large block sitting opposite a lay-by and below Clogwyn yr Oen. 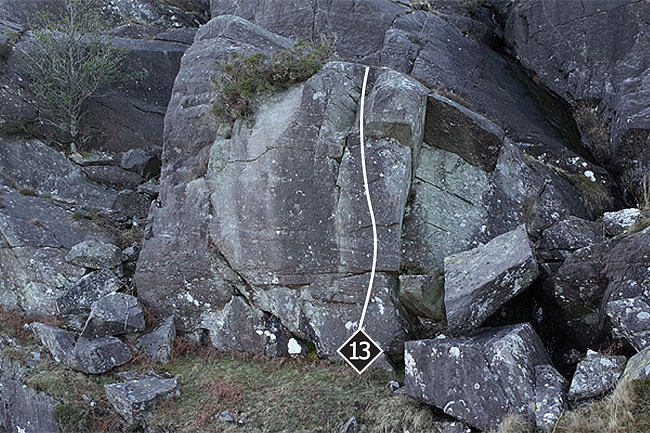 Traverse right-to-left across the slabby roadside face, then around the arête with difficult moves to gain and follow the juggy shelf across the steep face. A Tan y Grisiau classic. From a crouching start on opposition side pulls move up past the clean ledge and juggy flake to reach the shelf; finish leftwards along this. A further 100m up the road in a dip behind a fallen down wall more worthwhile problems can be found. A couple of variants are possible. 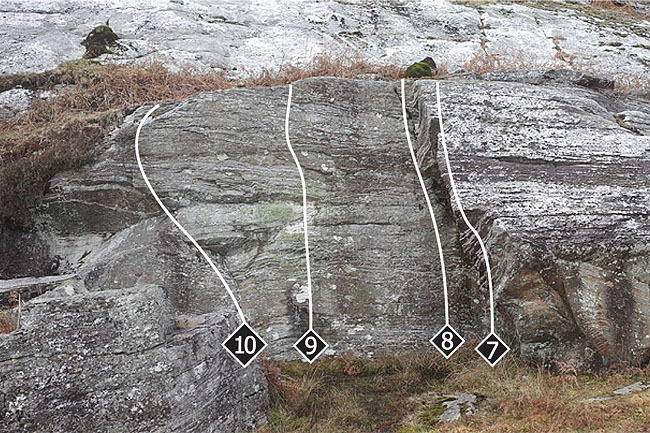 Pull on with your right hand on the open pinch on the right and left in the better of the original undercuts at 7C. 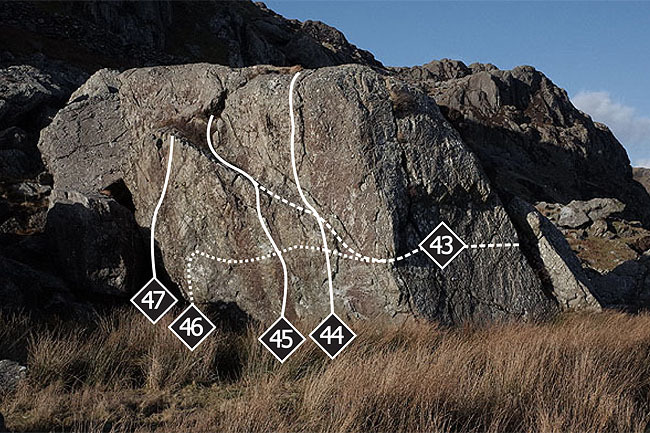 A harder (8A+) version starts lower with hands matched on the obvious crescent shaped hold, and then takes the better of the original undercuts with the left before making an improbable slap out right to the pinch. Sit down start up the left arête of the white face. The central line on the white wall. The right hand line on the white wall. Sit down start line on wall opposite Problem 60.